On December 29, 1890, U.S. army troops opened fire on a group of Lakota people who had been participants in the Ghost Dance. The dance, a religious ceremony that infused innovative visions into established ceremonial practices, promised to bring about a new way of life for Indigenous communities that were struggling to resist devastating federal Indian policies. 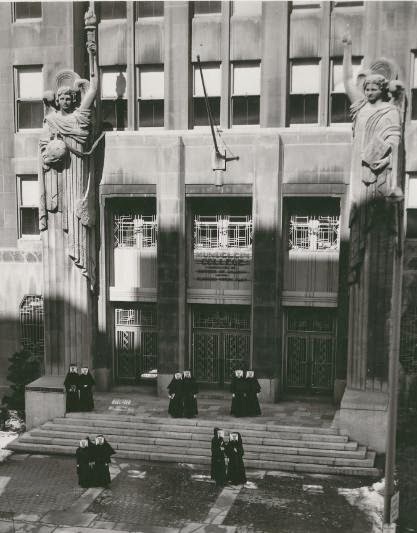 Detractors of the dancers had suggested that they were a danger to local non-Native communities as well as broader American society. When the 7th Cavalry was deployed to western South Dakota, dancers led by Big Foot left their nearby reservation against the wishes of the Indian agents. The military’s response was bloody. After tracking down the dancers and surrounding their encampment, US military personnel attempted to disarm the Lakota. When shooting broke out during the process, soldiers began to fire at the Lakota group at a close range and from a distance using high-powered automatic weapons. The camp descended into chaos, and when many of the dancers—men, women, and children—tried to escape the bloodshed, soldiers chased them down and executed them. How many times has this story been told? Too many? Certainly too many to count. Twenty-five years ago, historian Joel Martin published an important article, “Before and Beyond the Sioux Ghost Dance: Native American Prophetic Movements and the Study of Religion,” that took scholars of American religious history to task for the limited ways in which they included Indigenous religions in historical narratives. He critiqued the prominence of the Ghost Dance in these narratives, arguing that scholars generally offered an overview of Native American traditions near the beginning of their account, only to return to the topic when discussing the massacre at Wounded Knee. In Martin’s view, there were a number of problems with this limited representation. Texts that discussed the Ghost Dance often did not include accounts of earlier Indigenous prophetic and revitalization movements, much less, later practices. The common assessment of the dancers as tragically delusional downplayed their agency as well as the ways that dancers built on previous dances, like the Sun Dance. Regardless of the authors’ intentions, focus on the massacre functioned to suggest that the beliefs and practices of Native American communities and individuals declined and that their practices were not relevant in discussions of contemporary American religious life. As I was beginning my graduate studies, I engaged in research on media representations of the Ghost Dance leading up to and after the massacre. I moved away from further research in this area, in part because of what Martin identified as its questionable prominence. Yet studying this tradition—and the violence that we often associate with it—served as a starting point for what is now my first book project. In reading anthropologist James Mooney’s 1896 account of the Ghost Dance, I became interested in the early anthropological rendering and management of Native American religions. 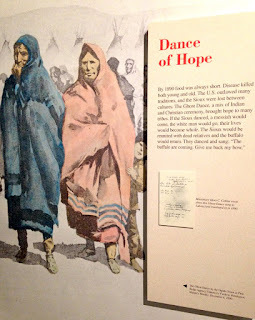 Recently, research for a new project turned my attention back to the Ghost Dance, and it’s given me the chance to think more about its role in American religious history, as well as the ways that the past—and past projects—can continue to haunt us. 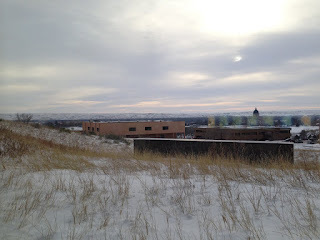 This past December, on the 125th anniversary of Wounded Knee, I was back in South Dakota. It was a blisteringly cold day, similar to what it would have been like over a century earlier for the dancers and military personnel. 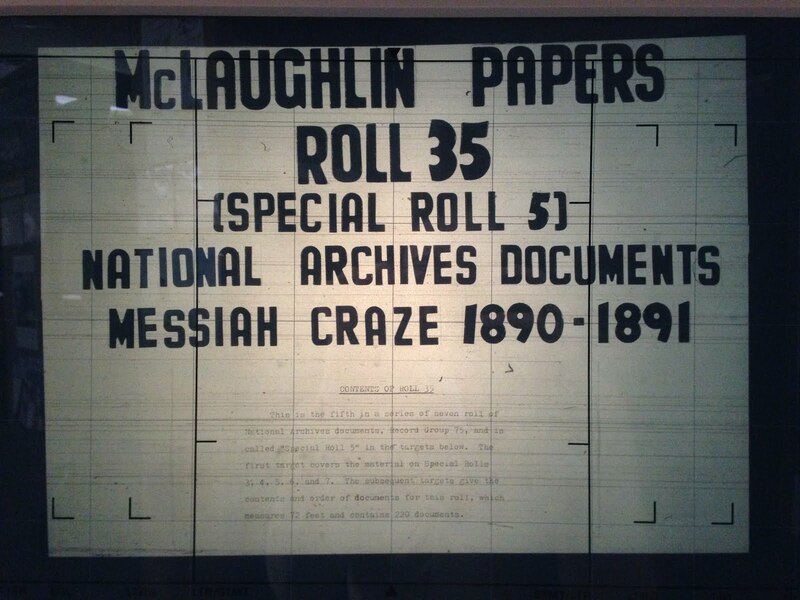 I wasn’t braving the cold; instead, I was sitting in front of a microfilm reader at the State Historical Archives in Pierre. In searching for leads related to a new project on medical imperialism, I came across references to the Ghost Dance. 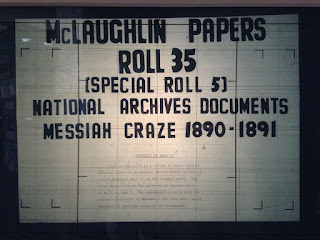 I was struck, all over again, by how historical sources had characterized the dance—as a “craze” and an “outbreak”—and how this terminology is preserved in the archive. In Ann Laura Stoler’s edited volume Haunted by Empire: Geographies of Intimacy in North American History, contributors examine spaces and times in which facets of colonial governance—systems, structures, policies—produce intimate connections, standards for closeness and proximity, and bittersweet unions of thought and practice. In Stoler’s words, to haunt is “to bear a threatening presence, to invisibly occupy, to take on changing form” (1). Empire haunts, but the moments, outcomes, and connections that imperialism creates—and the fractures, misery and loss that it leaves in its wake—can haunt, as well. These earlier colonial visions of the Ghost Dance still linger in the archive, specters of racialized notions that summon our attention and reinterpretation. Indeed, the violent event—described at the time as a “battle” and today as a “massacre,” represents a singular moment in American religious history. This event is significant for Native American religious history, American religious history, and for the broader study of religion—as a single case study, it raises important questions about race and religion, the violence of purportedly progressive efforts at missionization and assimilation, the role of religion in social control, the status of non-majority religions in law and politics, anxieties over new religious movements, and the elusive ideal of religious freedom. Thus, while I think that Martin’s critique is still relevant, I would hope that it ultimately encourages scholars to keep teaching the Ghost Dance—but to teach beyond it, drawing on a variety of scholarship in and beyond the field of Native American religions. 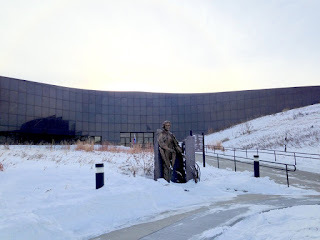 And teach it better, by including Indigenous perspectives (beyond those of Black Elk), and with a consideration of its legacy and the many responses it continues to inspire. 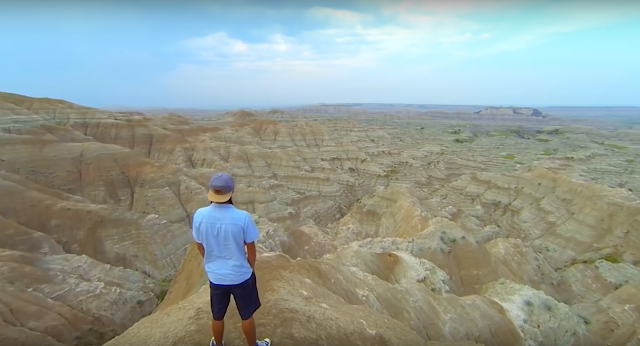 As one example, check out the work of Lakota hip hop artist Frank Waln. His songs and videos blend contemporary and established musical forms, and as he explains in in an interview, his lyrics connect violent historical moments to ongoing issues. 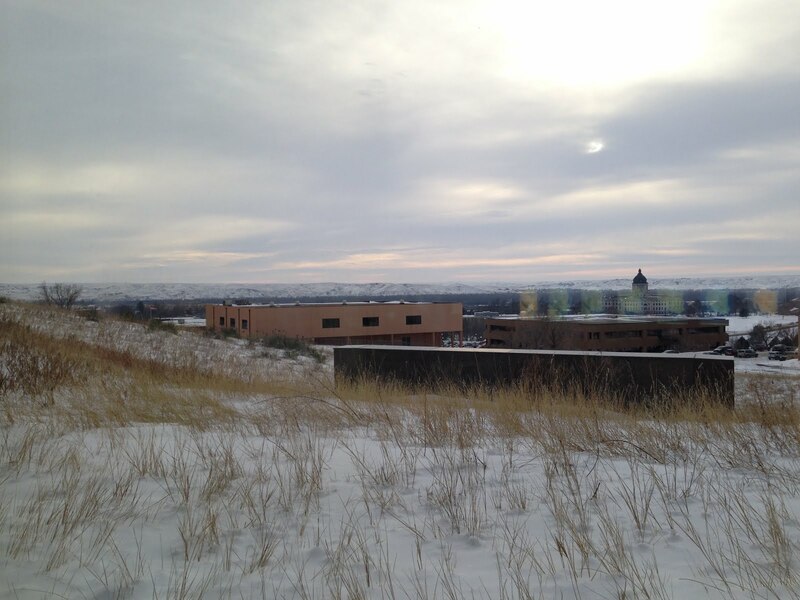 Most importantly, it’s important to emphasize the continuation of Lakota life and culture after the massacre Wounded Knee, rather than presenting it as the inevitable end of an era. So, while this event is controversial, I think it’s important that it continues to haunt us. We should continue to register the loss of life and the violence. And we should let it unsettle us into new lines of engaged inquiry (or back to old ones). From Frank Waln's 2012 video "My Stone"
Ghost Dance controversy in my book, How Sweet the Sound: Music in the Spiritual Lives of Americans (2004). Somehow I missed the Martin article as I was researching that chapter. I do remember being fascinated by Mooney's intrepid fieldwork.